Should wrestlers consider working with a personal trainer? Short answer – Absolutely. Long answer – Wrestling is a tough, demanding, sport that is extremely hard on an athlete’s body. During practice a wrestlers body gets beat up and in many cases there will be a lot of pressure put a wrestlers joints. Training for wrestling can no longer rely exclusively on long-distance runs and high rep endurance training. These exercises often eat away at your muscle and do nothing to improve strength. Wrestlers should consider a strength & conditioning program run by an experienced personal trainer. 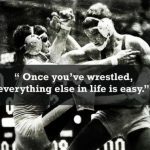 Personal Training exercises specifically for wrestlers. Personal trainers provide can provide several focused workout training plans specifically for wrestlers. Outlined below are some of the exercises that are recommended for wrestlers. Your main tools to build strength and power should be full-body, compound exercises. e.g. Deadlifts, Squats, Overhead Presses, Power Cleans, Lunges, Pull-Ups, Bent-Over Rows, Snatches and Push-Ups. These should be the primary focus of your Strength & Conditioning program. They’ll help you become stronger and more powerful on the mat. By pairing your main exercises with bodyweight exercises, you’ll maximize your time in the weight room and simultaneously work on your conditioning. Some exercises that you can combine include Squats and Pull-Ups, Overhead Presses and Inverted Rows, Power Snatches and Lunge Jumps, Deadlifts and Push-Ups and Bent-Over Rows and Dips. Grip strength is key for wrestlers. If you don’t have it, you are at a huge disadvantage. You should do grip work every time you train. Use exercises such as Towel Pull-Ups, Farmer Walks, Tennis Ball Squeezes and Fat Gripz Bent-Over Rows. By pushing the pace during your time in the weight room, you will also develop a level of conditioning needed to compete on the wrestling mat. By pairing exercises and using short rest periods, you will get stronger and train your stamina at the same time. If you need extra conditioning, perform a bodyweight circuit after your workout.